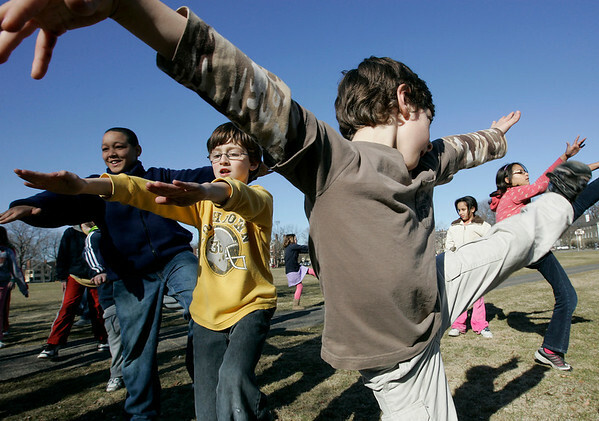 Salem: From left, Hector Toribio, 11, Kevin Logli, 9, and Mark Altshuler, 8, all of Salem practice high kicks before running a mile around the Salem Commons. The boys were part of a group from the Boys and Girls Club who ran a mile around the Common to support Beth O'Grady's effort to raise funds in memory of her brother, Steve, a former club director who was killed in a car crash. Beth will be running her 10th Boston Marathon this year to fulfill a commitment to her brother. Photo by Deborah Parker/Salem News Wednesday, March 25, 2009.